. . . it was in the late morning in the summer of 2010 [actually late May of 2010]. My wife and I were coming back from . . . Skamania Lodge on the Washington side of the Columbia River Gorge. At the time we lived in the Portland Oregon area, and we were driving back west on I-84 to get home. When driving West on I-84 in that spot you have high rockwalls to the south of you that are a couple hundred feet and go as high as a couple thousand feet in some spots. To the north of you when driving west on I-84 is the columbia river.
. . . all of a sudden coming left to right across the highway about 100 yards (give or take) in front of us came the most odd looking thing I have ever seen flying. My wife and I both immediately said “what was that?” It was flying pretty low to the ground probably only about 30 feet or so off the ground, and we only had about 2 seconds of visual on it, because it came swooping over the trees on the left side of the highway and went between a gap of trees on the right side of the highway. It had a longer neck, crested head, big curved wings that connected at the back of the body, and a long tail. Out of all those things the tail is what really stood out to me. The tail was longer then the animals whole body from tip of head to base of tail. It also had a very slow wing flap. It flapped twice to get across the highway, two big and very slow flaps. . . . The man was not sure if the flying creature was without any feathers, but his wife was pretty sure that it was showing skin rather than feathers. Nothing in this man’s communications with me hints at any hoax; he appears credible. The North American ropen is no myth. Switek seems to use bulverism rather than reasoning . . . He does not use the word “philosophy,” however, using the phrase “science of evolution” . 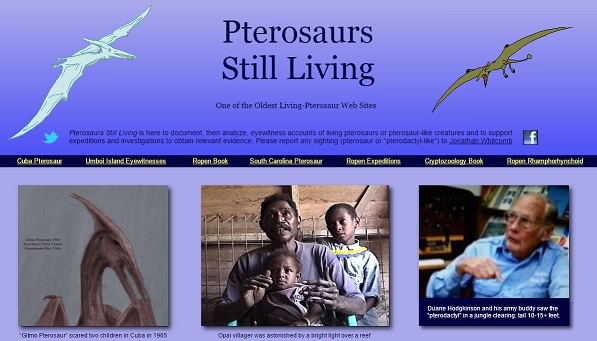 . .
A Smithsonian blog post (Oct 16, 2010) by Brian Switek dismisses both the ropen of Papua New Guinea and any hope for any living dinosaur or pterosaur. He does so with the phrase “ropen myth,” ignoring all major evidences that favor a living animal.
. . . riding [a bike] down an old country road . . . I looked to my left, and on a wood plank fence were two of the biggest bird-like creatures I could ever imagine! I almost crashed my bike! This book is available from Amazon and other online book sellers.